Maho Beach is one of the most popular beaches in the Caribbean. It is not the most beautiful beach in the Caribbean and it is not one to which the international rich and famous flock because of its unparalleled luxury. 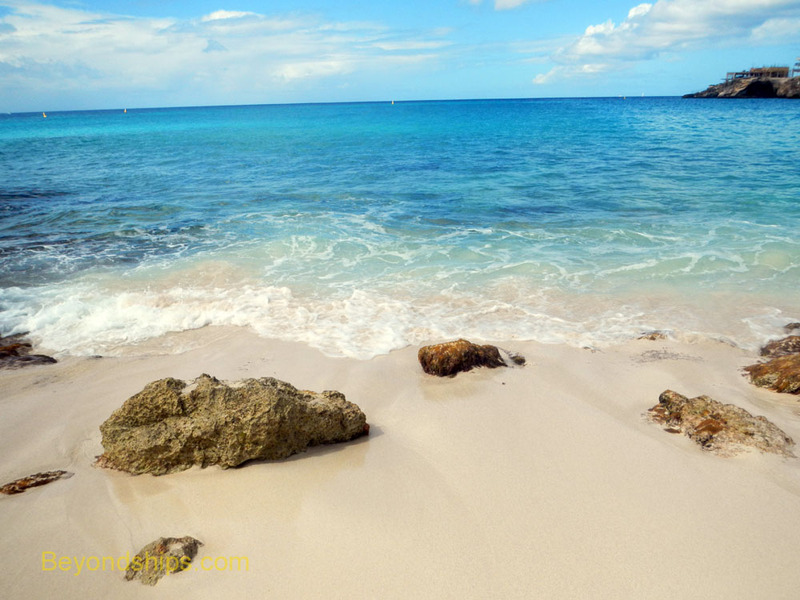 Indeed, what attracts thousands of visitors each year to Maho does not even occur on the beach but rather the attraction is what happens above it for Maho is St. Maarten's famous airplane beach. Located at the end of the runway at Queen Juliana International Airport, Maho is famous because airliners and private planes swoop low over the beach as they approach the runway. Visitors scan the horizon for a small dot that quickly turns into an approaching plane. In a matter of seconds, the aircraft, landing gear extended, is over the sand. You turn as it clears the fence that separates the beach area from the runway and in a moment the plane is hurtling down the pavement moving further and further away. Such sights occur frequently at Maho. Queen Juliana International Airport is one of busiest in the Caribbean. The locals say that it is second only to the main airport in San Juan, Puerto Rico. Thus, you do not have to wait long to see a plane come in. If you do not want to sit scanning the horizon, the Sunset Bar at the southern end of the beach maintains a chalk board with each day's schedule. Thus, visitors can plan their activities around the flights. The beach itself is a small crescent shaped beach. It consists of a strand of white sand that quickly slopes down into the water from the road that skirts the fence at the end of the runway. At either end of the beach are rock outcroppings. There are also occasional rocks that lie just under the sand and just under the water so you have to watch your step in places. Waves break against the beach. However, people do frolic in the water. The cool water can be very refreshing as it washes over your feet. There are bars at either end of the beach and vendors rent umbrellas and beach chairs. Nearby is a casino and a shopping plaza. The area has been extensively developed so if you are looking for pristine natural scenery, Maho is not the place for you. In addition to providing a place for aircraft to land, the runway is also used for take-offs. Aircraft taxi to the end of the runway that is just across the road from Maho. They pause there to rev their engines before taking off. Signs attached to the airport fence warn visitors not to hang onto the fence in hopes of feeling the jet blast when airplanes are revving their engines. This can be quite dangerous as the blast coming out of the back of a jet can be very powerful. Indeed, it is what enables the aircraft to fly. One local told me that she has seen people thrown from the fence into the sea, which is a good 20 yards. Inasmuch as some people are not deterred by the signs, the St. Maarten police also patrol the road that runs by the fence. 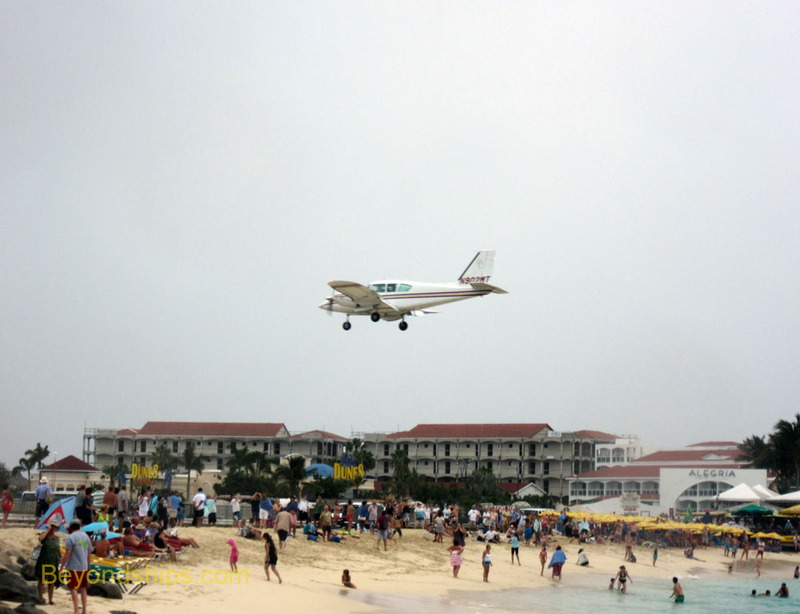 Most visitors get to Maho Beach by taxi. Fares start at $20 for one or two passengers. The per person rate drops as the number of passengers increases. Most taxis are vans that can hold 10 or so people. Because of the popularity of Maho, some cruise lines have begun to offer a transfer to Maho as a shore excursion. The price is considerably more than a taxi and you have to go and come back on the tour's timetable. However, you do have the comfort of knowing that you have a guaranteed ride back. In addition, the tour that we took used a comfortable touring coach and a knowledgeable guide gave a commentary. Maho is not all that far from the cruise terminal as the crow flies. However, in order to get there (and to return), you have to go through Philipsburg. There is also another well-developed area as you get towards the airport. As a result, there is quite a lot of slow-moving traffic. Thus, assume that it will take at least a half hour either way. Along the way, there are some good panoramic views of Simpson's Bay and of Great Bay. Maho often becomes quite crowded when there are several cruise ships in port.